천상규, 박대원, 길경석,(2011).선박평형수 처리용 자외선 램프 및 안정기 개발.한국마린엔지니어링학회지,35(5),675-681. 본 논문에서는 선박평형수 처리시스템의 핵심부품인 중압 자외선 램프와 자기식 안정기의 설계 및 제작에 대하여 기술하였다. 자외선 램프의 최적 방전조건을 확보하기 위하여 봉입되는 아르곤 가스와 수은량 변화에 따른 전기ㆍ광학적 특성변화를 분석하였다. 시제작 램프의 전압은 490 [V], 전류는 8.6 [A], 전력은 4.0 [㎾]이며, 자외선 세기는 현재 사용되고 동등한 제품과 비교해 15 [%] 이상 향상되었다. 자기식 안정기는 이론적 해석과 시뮬레이션을 통해 UI 코어를 사용한 단상 내철형으로 설계하였으며, 무부하 전압은 920 [V]이고 정격출력은 8.5 [㎸A]이다. 시제작 자외선 램프 및 안정기를 적용한 350 [㎥/h]급 선박평형수 처리시스템에서 해수에 포함된 플랑크톤 사멸률을 평가한 결과 99.99 [%] 이상으로 IMO에서 정한 규정을 만족하였다. 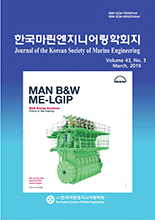 In this paper, we dealt with the design and fabrication of a medium pressure ultra-violet (UV) lamp and a magnetic ballast which are main components for ballast water treatment systems (BWTS). To acquire an optimal discharge condition of UV lamp, electrical and optical characteristics depending on the argon gas volume and the amount of mercury were experimentally analyzed. Rated voltage, current and power consumption of a prototype lamp were 490 [V], 8.6 [A] and 4.0 [㎾], respectively. UV intensity of the lamp was 15 [%] higher than that of an equivalent lamp which is used in a BWTS. The magnetic ballast was designed in a UI core type through theoretical analysis and simulation. The open voltage and the rated power consumption of the ballast were 920 [V] and 8.5 [㎸A] respectively. The disinfection efficacy which is carried out in a BWTS equipped with the UV lamp and magnetic ballast was over 99.99 [%], and this satisfy the IMO regulations.